A Surprise Start is a perfect way to begin a really special evening, providing the perfect combination of excitement, surprise and laughter for your guests. The scenario is a simple one: our professional opera singers will subtly appear ‘disguised’, for example, as waiters or fellow guests. At the given moment they will burst into song and enthral your unsuspecting guests, eventually revealing themselves to be distinguished opera singers who have performed at the Royal Opera House, English National Opera or Glyndebourne. What better way to make your event stand out, giving your guests a thrill they will talk about and remember for years to come? After a surprise start our singers can then go on to present an entertaining and contrasting programme of well-known pieces from the world of opera, operetta and musicals. We will work with you to create the perfect programme for the occasion and include any special requests you may have. The programme can range from celebrated arias and ensembles from the great operas such as ‘Carmen’, ‘La Traviata’ and ‘Torandor’, to an operatic arrangement of a pop song such as ‘Bohemian Rhapsody’ or ‘Wannabe’. The sky’s the limit! What makes us different from other ‘singing waiters’? This is no gimmick; our singers are distinguished and talented opera artists who have performed with some of the most esteemed opera companies in exclusive venues around the world. 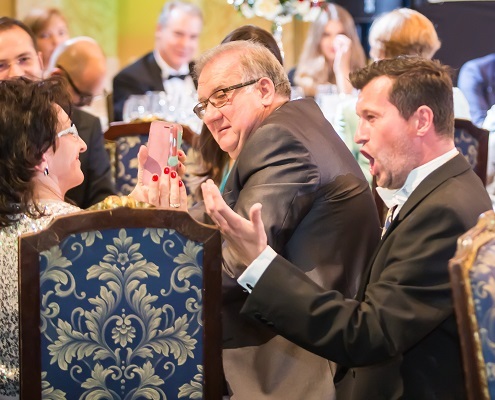 Your operatic entertainment starts with the element of surprise and then continues into a fuller performance of the highest artistic standards, adding an extra dimension to what will already be a thrilling evening of opera. This winning combination can elevate your event above all others, guaranteeing it will remain a talking point for years to come. London Festival Opera keeps the surprise effect very simple, not involving any unnecessarily lengthy scenario. Rather our ‘waiters’ subtly join the staff or guests for a short time and blend in before bursting into song at the given moment. By the end of the opening piece your guests will be in raptures, starting the operatic entertainment element of your party or event in a fun, relaxed and innovative way. LFO has presented opera with ‘surprise’ car technicians, security staff, police men and women, auction house porters, medical staff – the possibilities are endless! We pride ourselves on rising to a challenge so if there is a particular disguise that would suit your event or the tastes of your guest of honour, for example, please just let us know.